Lokmanya Tilak Municipal General Hospital, Sion, Mumbai. EMR section. 10th March 2015. Bed 1 was me with the patient, Raja Patil. Weight - all of 45 kilos, age - 40. Chronic liver degeneration and something called congestive cardiac failure (yet to be diagnosed). Bed 3 was a 20-year old kid brought in by his parents who lived in Kurla and who'd drunk phenyl in fear of his upcoming 10th standard exam (which he'd already attempted 4 times). Bed 6 was a middle-aged lady whose husband was abusing her (evident from her black eye, bruised face and her conversation with her friend) and who had a stroke of some sort in front of my very eyes. The right side of her face was twitching and her limbs were flailing. Her companion was stricken and scared. Interns were milling around her. Bed 11 was a small kid. Maybe 5th grade. He was panting loudly and his fingers and toes had curled inwards. The doctors/interns weren't sure what the problem was and were trying to reach their superiors. The dad (a workaday guy) was panicking. One of the interns advised that he (the child) breathe into a bag. I remembered I had one in my bike. I reassured the dad, rushed outside and got it. He thanked me and turned back to his son. I stood there bemused and shocked. It was an assault on the senses. I was numb. Every bed was a tragedy and every patient was a story. Raja Patil seemed insignificant. I seemed insignificant. What was I doing here? Back in December of last year, Raja Patil started taking a lot of leaves. He washed the vehicles in my apartment building in Airoli, Navi Mumbai. My beloved car and equally loved bike stayed unwashed for days on end. My fellow residents were suffering the same way. Whenever we saw Raja, we'd criticize him for taking leaves. We'd ask him to drink less and we'd ask him to amend his ways if he didn't want to get fired. After an especially caustic tirade one day, I remembered an incident. To wash the roof of my car, he'd upended a bucket, stood on it and wiped it clean because his height was insufficient. He didn't shy away from the task. He did it and did it thoroughly. That didn't look like a lazy man to me. I've seen people shirk their duties and I've done that too when I'm feeling lazy. Nobody's perfect. But you get a feel for the character of a person when you see him or her work when he or she doesn't know anybody's watching. The next time I saw him, I asked him why he was taking so many leaves. He showed me a wound on the back of his head and said that he had constant headaches and fever and a never-ending body-ache. The wound was bad. It was something out of a slasher movie like Saw or Hostel. I could see the skull. I was aghast. 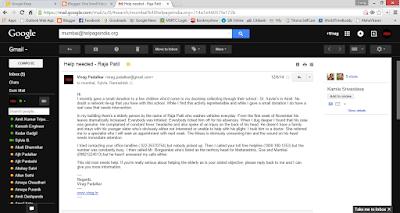 I immediately took him to my doctor - a very kindly woman named Ujjwala Dongarwar who has a clinic in Airoli on RG Marg. She diagnosed him and suggested that Raja needed a surgeon for the wound and a few checks to diagnose other ailments he obviously had. She referred me to a specialist. She didn't take payment. Unfortunately, this specialist was available only in the mornings and I really couldn't work out my schedule. The matter lagged for a couple of days. Then the subsequent week, a bunch of kids knocked on my door asking for Helpage India donations. That set me thinking. I first tried the Helpage India Mumbai number. No answer. I then called them on the helpline listed on their website. Long hold (maybe they should consider outsourcing this). Then I checked out their website and got a few contact numbers for individuals. No answer. I then sent an email to them explaining this situation. I got a response on 12th dec 14 asking for more information. Through a series of emails, we identified that a Helpage mobile unit was going to be stationed at Thane early Jan-15 and that I could take Raja to this unit. Help would be given. Unfortunately, by this time (this exchange happend on 05th Jan 15); we could no longer find him. He had stopped coming to work and when we checked his home, it looked abandoned. The watchman of my building kindly guided me to a country liqour bar he frequented but nobody had heard of him for a few days. Towards the end of February, he turned up again. He claimed he was sober, the wound was healing and he had gone to a Municipal Hospital. He looked relatively better. However, the hospital he had gone to had strangely referred him to the ICCU unit of Sion Hospital for inpatient treatment. If he felt better, why would a doctor advise him to get admitted? It felt weird. I suggested that he go to Sion Hospital and do what the doctor advised. A few days later when I asked him about his health he requested that I accompany him to Sion. By this time, he said he was feeling breathless all the time and his legs had swollen up. 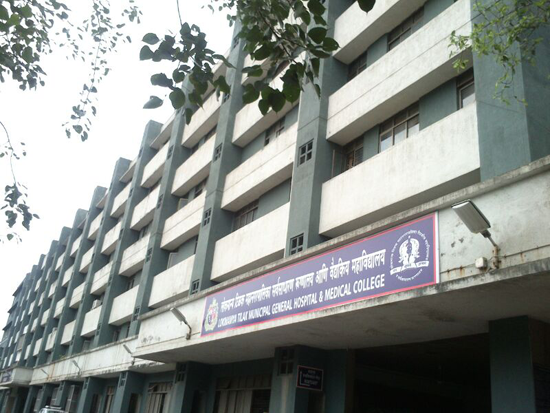 So off we went to Lokmanya Tilak Municipal General Hospital in Sion, Mumbai. I first took Raja to the second floor where the ICCU was located. I asked him to sit on a bench outside while I searched for assistance. I noticed a couple of young interns standing just outside the ICCU. I went up to them and asked them for help. One of them very kindly guided me inside to meet the shift-in-charge and helped me get started. She directed me to the EMR counter where fresh cases were being given a case-paper and explained all the procedural formalities to me. From the second floor, I came down to the EMR counter (I suppose it stands for Emergency Medical Room) and got started. I had the case paper made, consulted a guardian intern outside the EMR and was then guided inside along with my charge. The melee was phenomenal. Cries, smells, sounds and people greeted me like a railway platform at rush hour. Here a man was lying wasted on a gurney and there a child was bawling his lungs out. It was nothing like anything I had seen before. I walked up to the intern in charge (she looked like she was in charge because she was surrounded by patients hankering for her attention). After some attempts at getting her attention (in all fairness, she was beseiged with patients), I did manage to catch her eye and explained Mr. Raja Patil's situation to her. She suggested an ECG, guided us to Bed 1 and instructed her assistant interns to get cracking. The poor souls unfortunately had a faulty ECG machine. They were already trying to get it functional for Bed 2 and we therefore had to wait our turn. I observed that the ECG machine was a box connected to a set of wires with clamps at the end. These clamps were coloured and they were meant to be attached to a corresponding pin of the same colour at the end of the set of wires. One of these wires was broken and was taped. The taped portion was a loose connection. The connector where the wires were joined to the machine was a lot like a printer port. The interns called out to the orderly to replace the wires and I could see him struggling. Since it was in my own interest to move things along, I jumped in. Both of us replaced the clamps from the old set of wires to the new set of wires. We then connected the set of wires to the ECG machine. Once this was done, we found that one of these clamps was a small rubber ball which created suction and stuck to the chest so that a reading could be taken. The rubber ball was torn. We taped it up with medical adhesive tape and were set to go. Once Bed 2 was done, the interns moved over to Raja. They immediately identified that his liver was abused (for lack of a better word). They strapped the ECG machine to him and off we went! Once this was done, the female intern in charge (Kanchana) instructed me to get something called a Trop T Test. I went to the medical store behind the hospital and bought this kit. Once this was done, Kanchana took the ECG, the result of the Trop T test (which was negative) and took them to her superior. While this was happening, the interns slid off to their lunch leaving me and Raja Patil to the mercy of the elements. Bed 3, 6 and 11 were stories unfolding right before my eyes. I couldn't stand it anymore. I sought out Kanchana, found out from her that Raja was suffering from liver failure and heart problems (chronic liver disease and congestive cardiac failure were the terms Kanchana used), got Raja's admission papers made and ensured he was admitted. Then I gave him instructions on the medications he was being given and walked out; 4 hours after I had walked in, a shaken man. Back to my 1530 IST appointment, my daily routine, my safe and secure world of an air-conditioned office and the comforting arms of my beautiful wife at the end of a long day. But on the drive back, I reflected. What was the lesson that I was taking away from this episode? I pondered on this for quite some time. Was it that the system was broken? Or that it still had not collapsed enough to the point of anarchy? On one hand, I was living in a system where Raja Patil was forced to wash cars despite being physically weak and old. 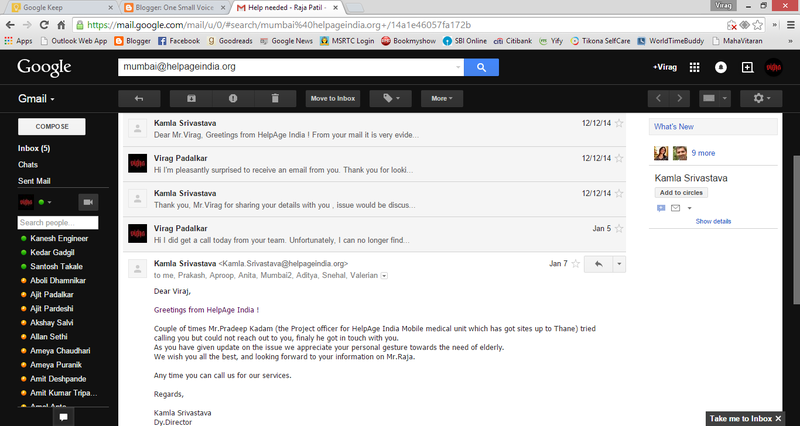 On the other hand, I was also living in a system where I received a response from HelpAge India to give him assistance. On one hand, I was living in a system where residents of my apartment complex shouted at Raja without understanding his problems. On the other hand, I was also living in a system where my doctor (Dr. Ujjwala Dongarwar) refused to take money to check Raja and give him advice. On one hand, I was living in a system where politicians have so much money that they don't know what to do with it but a hospital doesn't have a functional ECG machine. On the other hand, I was also living in a system where we had the ingenuity to fix the machine with the tools at our disposal to ensure that patients were treated. On one hand, I was living in a system where interns slid off to have lunch right in front of my eyes leaving Kanchana to man the entire EMR herself. On the other hand, I had Akshay (another intern) who slogged on and I had Kanchana herself who bravely handled all patients who came in with a resilient battle-hardened fury and determination. It was very easy to blame everybody and come away with a sense of desolation. I could almost slide into that frame of mind without effort. But I also knew that it is our response to our problems that determine how they are solved. We can either crib, or we can jump in, pull up our sleeves and try to fix the problem wherever possible. I hope years from now in the evening of my life; I am able to look at myself in the mirror and count myself amongst the latter. I admit I came away shaken and stirred. But I'd do it again.